Our Pen Pals Visited Philadelphia and Sent Us Souvenirs! Fictitious pen pals tour Philadelphia and send their partner schools cultural souvenirs. 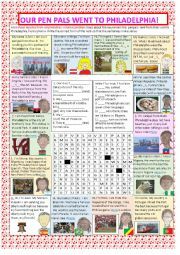 Includes gap fill with correct verb tense, wordsearch, True/False, video links of the cultural points of interest. Images and links are cited in the bibliography. 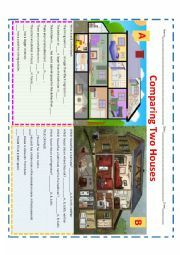 Describing a house, locations and names of rooms. 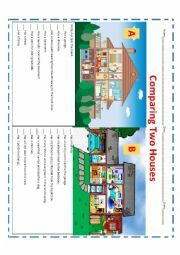 Students compare two houses and answer questions about them. On page 2 they decide what they would change about the houses to improve them. 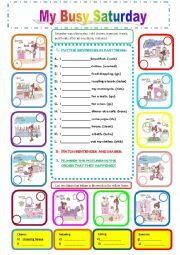 A worksheet to practice the difference between specially and especially. Many thanks to Bruce yanogator http://www.eslprintables.com/buscador/author.asp?user=610878 for his explanations, which he kindly gave me permission to use. This jeopardy game allows students to practice basic vocabulary: days of the week, months, numbers, telling the time, and classroom objects. 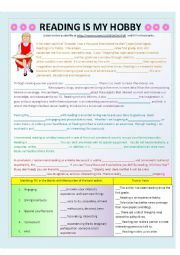 (file size 426 KB) Perfect for a review of vocabulary or extra practice. I made this powerpoint jeopardy game using a template from http://teach.fcps.net/trt10/PowerPoint.htm It has the following categories: prepositions in/on, short answers, traffic signs, question tags, there is/there are. 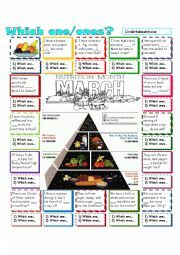 I hope it is useful. 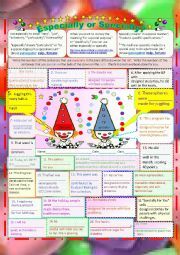 This is Part Three of the series on comparatives. 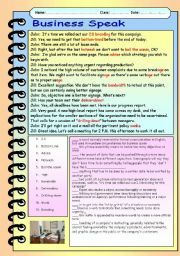 Part One covered regular comparatives. Part Two covered doubling the final consonant. Part three covers words ending in -e, where we add only an r.
This is part two of the comparatives series. Part One dealt with regular comparatives. 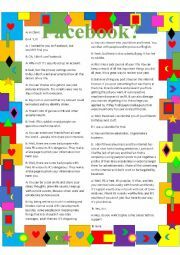 Part two deals with one syllable words that require the doubbling of the final consonant before adding -ed, in order to preserve the short vowel sound.